"...there were other artists working at the same time who knew little about Western art adn were less affected, for whatever reason, by the industrialization and modernization that was occurring in Japanese society. Winter Peony... by Yamamoto Shōun (1870-1965) is part of a series that was published from 1906 to 1909 by the venerable Tokyo publishing house, Matsui Heikichi. Little is known about Shōun other than that he was trained in several different styles of traditional Japanese art, and as a young man he designed kuchi-e (frontispieces) for popular magazines. However, a brief glance at Winter Peony reveals that it was designed by an artist working unselfconsciously within the ukiyo-e tradition. 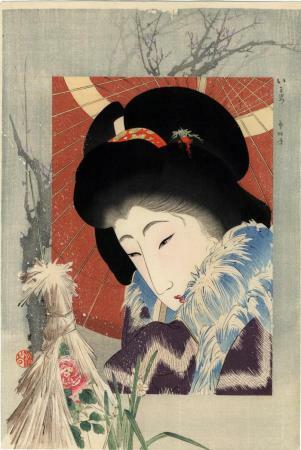 The central image of a beautiful woman under an umbrella muffled up against the cold is a direct descendant of the large-head beauties in ukiyo-e prints of the 1790s. Moreover, the subject itself refers to a ghost story that was popular in the eighteenth-century kabuki plays and ukiyo-e prints. The story is about a white heron that becomes human and falls in love, but when her lover abandons her, she disappears in the midst of an early spring snowstorm. 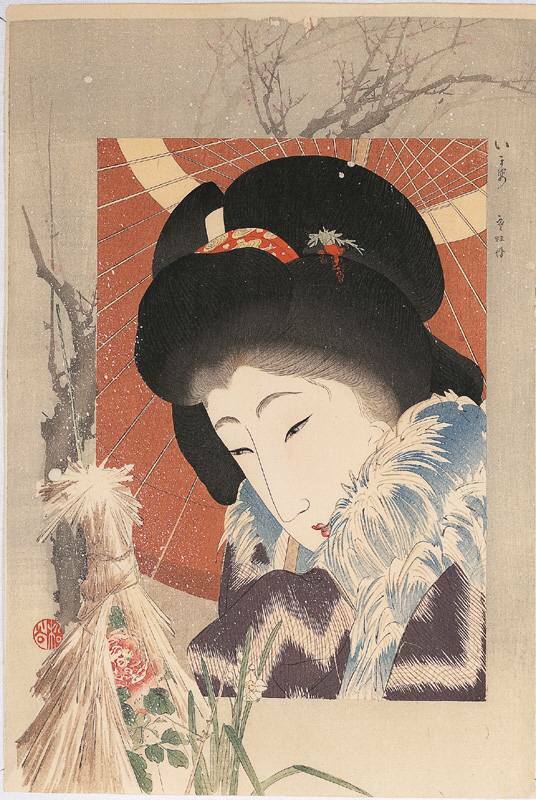 Shōun refers to the story not only by placing his subject under an umbrella in falling snow but also by making the scarf that muffles the woman's shoulders appear to be made of feathers. The peony blooming under a protective straw cover next to a narcissus indicates the season: in Japanese, the big, wet snowflakes of spring are called botan yuki (peony snow)." 1) a small black and white illustration on page 26 of Shin-Hanga: New Prints in Modern Japan. 2) color in The Artist's Touch The Craftsman's Hand: Three Centuries of Japanese Prints from the Portland Art Museum, p. 51. The publisher was probably Matsuki Heikichi, aka Daikokuya Heikichi. The example in the Freer/Sackler Galleries has the publisher's seal prominently printed in the lower right of their copy.